Diagnosed with osteosarcoma in November, Owen Brady is now in the midst of chemotherapy as he battles to get back on the ice. Drafted by the OHL's Oshawa Generals, Brady is keeping his "head down and (rolling) with the punches" as he eyes a return to action by the 2020-21 season. Judging by the fact that on Wednesday morning – actually it was closer to noon – Chris Brady was cooking his son a package of sausages and three eggs for breakfast, it’s fair to say that not even chemotherapy treatments can slow down the metabolism and appetite of 16-year-old Owen Brady. In fact, aside from losing his hair and a few other minor side effects, the impact on his body has been minimal. When you’re dealing with cancer, you take your triumphs where you can get them and, relatively speaking, they’re coming in at a pretty good clip for Owen lately. He’s currently in the midst of his second of six 35-day chemotherapy cycles that will take him through September. He no longer needs a wheelchair and his right leg, which had the fibula removed to replace the bone graft in his cancerous left shin, will start to bear his full weight within the next few weeks. In fact, he’s looking to be back on his skates by June, with an eye to returning to play full-time by September of 2020. And after the OHL draft last weekend, he now has a team. 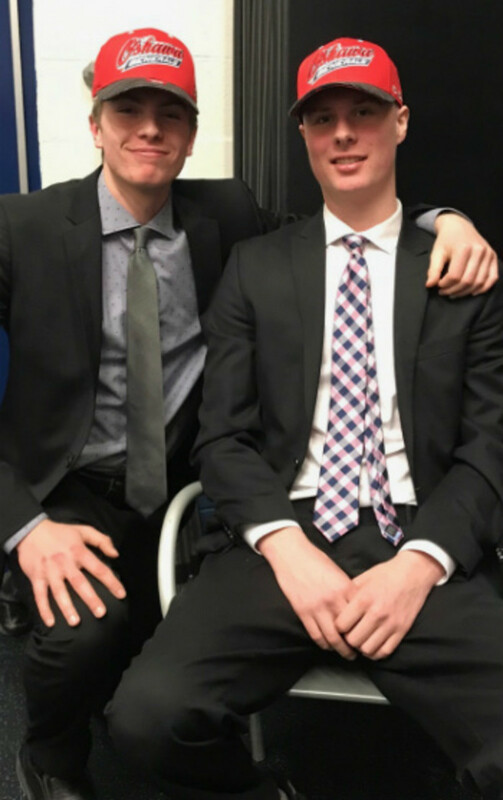 Based on his play last season with the Whitby Wildcats midget AAA team, Owen would have been a second-round pick, with an outside chance of going in the first round. That didn’t happen, but the Oshawa Generals stepped up to take him 106th overall. That put him in the sixth round, but it should be noted that he was the Generals’ fourth pick in the draft and their first of a defenseman. Owen’s odyssey began last summer when he noticed what he thought was a harmless bump on his left shin. Even though it caused no discomfort, it continued to grow. He went to see a doctor in November and learned he had osteosarcoma, the kind of cancer Terry Fox had, a highly curable form of the disease, but one that would require invasive surgery and a long recovery process. A big part of that process was removing the fibula from his right leg to replace much of the tibia in his left where the tumor was located. That essentially killed any chance Owen had of being a high draft pick, but his hometown OHL team took him with its fourth pick, knowing it will likely have to wait another 18 months before seeing him in uniform. The Generals have invited him to their rookie orientation camp next weekend and full training camp in September. He won’t be on the ice, but he will be indoctrinated into the organization. He and nine of the Generals other draft picks were introduced to the home crowd prior to the Generals’ second-round playoff game Tuesday night and Owen was able to join them on the red carpet, albeit on crutches. But after months of uncertainty, knowing he has an end goal has been a motivating factor. Owen has begun working out with an eye to getting back on the ice in the summer, but the timeline is a long and somewhat fuzzy one. Even though the cancer is under control, the biggest factor will be when the replaced bone calcifies and fuses completely. The Generals have said he can skate with the team when he’s ready and there is a slight chance he might be able to join a major midget team late next season. “That bone has its own agenda as far as healing,” Chris said. For his part, Owen is looking forward to the day when he can pull on an Oshawa Generals sweater and his biggest worry will be what number he wears. His customary No. 2 currently hangs in the rafters of the Tribute Communities Centre. Some guy named Bobby Orr wore it a few years back.